The Oxford Union's recent decision to allow BNP leader, Nick Griffin, and convicted holocaust denier, David Irving, to take part in an upcoming debate has been cited by two of the world’s leading experts in matters of racial and religious oppression as the reason they are refusing to attend the free-speech event. "Frankly if that debate goes ahead with the leader of a tiny party of fairly nasty people and a revisionist historian, then it isn't the debate for me and is a pretty weak showing," said President Mahmoud Ahmadinejad. "My Holocaust conference had hundreds of deniers at it! Hundreds! What's more I could phone around and get another hundred who want to lead a new Holocaust right now!" The Union has always had a provocative platform and been unafraid to engage controversial speakers, however the recent furore has cast a cloud over the learned institution. "There was a time when the debates were attended by leading figures who had direct expertise of some of the most contentious issues and opinions. Look at the guest list now. These people are just theorists of mass brutality, and poor ones at that! Even if I was asked, I wouldn't want to be on a stage with such minor players as Nick Griffin," said Zimbabwean President, Robert Mugabe. The Union says that the quality of debate is still as high as ever, and denies that it had been forced to invite second rate speakers for shock value. "I think it is unfair for people to describe Mr Griffin as an overweight, stereotypical, racist leader of a small and inconsequential party," said student representative, Herbert Billingsworth. "I believe he has slimmed down recently." Mr Billingsworth lamented that the BNP leader and David Irving were in fact replacements due to the unavailability of the Union’s preferred speaker on matters of free speech. 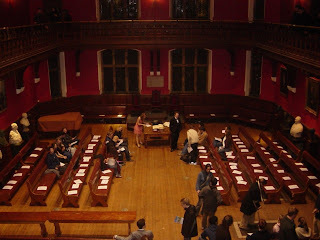 "We drew up a short-list of attendees who not only have first hand experience of the limits of free speech in the media but that we felt would be able to appeal to Oxford Union members as intellectual peers," said Billingsworth. "Unfortunately Jade Goody was unavailable." I guess even despots have standards!